Facing upheaval triggered by economic, societal and industry influences, financial services is primed for a landmark shift. The industry finds itself catering to an increasingly demanding consumer, while contending with relentless sophisticated security threats and managing ever-growing volumes of data. Advances in cognitive computing can help manage this increasing volume of data while exploiting it for greater insights. Cognitive-based systems can build knowledge, understand natural language and provide confidence-weighted responses. Despite the enthusiasm for cognitive, organizations need to realize there is often a steep learning curve. In terms of system implementation and user interaction, cognitive systems are fundamentally different than traditional programmatic systems. Banking and financial services organizations can learn from pioneering organizations that have already implemented cognitive. Download this report as it examines current and future applications for financial institutions, and provides recommendations for those embarking on the cognitive journey. 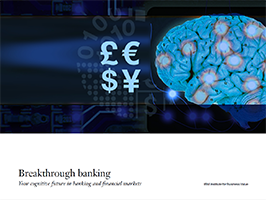 It also offers insights from banking executives who understand how cognitive capabilities can help push the current boundaries of innovation and growth.